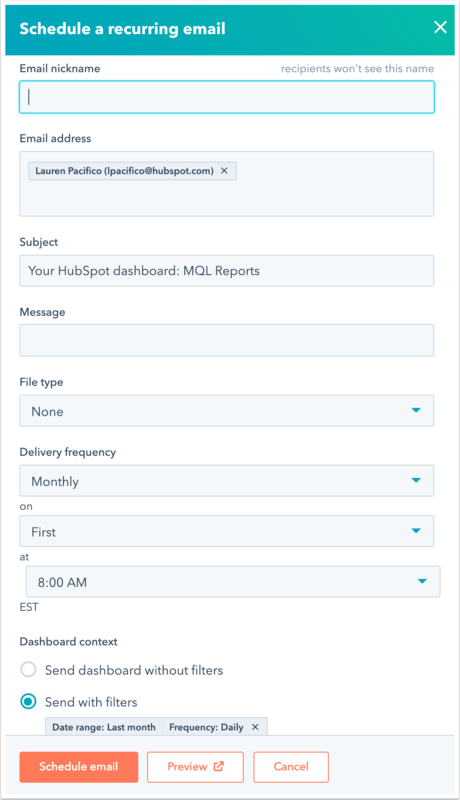 You can email your reports dashboards to any users in your HubSpot account. Only shared dashboards can be emailed; if you want to email a private dashboard, learn how to change your dashboard's visibility setting. At the top right, click the Share dropdown menu and select Email now or Create new recurring email. One-time email: enter the recipient email address, subject, email nickname, message, and file type and format. If the email address you enter is not a HubSpot user and you have permissions to add and edit users, you will be prompted to create a new user. Recurring emails: choose to send a templated Monthly report email, a templated Weekly report email, or select Custom recurring email to set a custom delivery frequency and custom filters. Enter the recipient email address, subject, email nickname, message, file type and format, and adjust the delivery frequency if needed. If the email address you enter is not a HubSpot user and you have permissions to add and edit users, you will be prompted to create a new user. Click Send now or Schedule email. If you've set up a recurring email and would like to access or edit it in the future, click the Share dropdown menu and select Manage recurring emails.